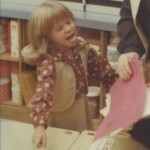 My avatar is me at age 5 in 1978. I am showing my mother my work during fall Open House at my elementary school in Pittsburgh, PA.
Ugh! struggling with after 40 weight gain. Too much stimulus on which foods to eat. Too many different fads, contradicting data and information. Any suggestions on online groups that support midlife weight gain for women? Just watched WIRED video and learned of this site!